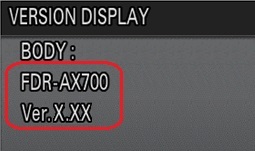 This update is only for FDR-AX700 cameras that currently have firmware version 1.00. 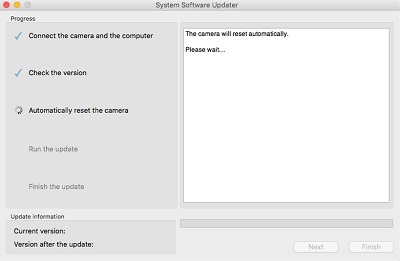 If your camera firmware version is already 1.01 or higher, this update is not necessary. On the camera, select Menu, OTHERS, and then VERSION DISPLAY. If the version number is 1.01 or higher, the camera does not need this update. If the version number is 1.00, you should install this update. 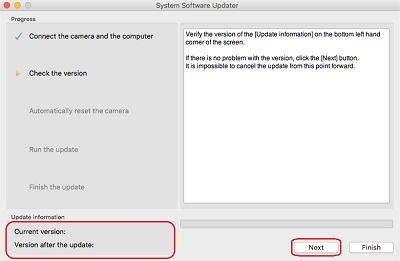 Your camera needs to be connected to a computer to install the update, but do not make the connection until innstructed to do so. This update can only be performed when the remaining battery level has three bars or more. When performing the firmware update, it's recommended to use a fully charged NP-FV70A rechargeable battery pack or the AC adaptor. Use only the USB cable supplied with the camera. Update functionality is not guaranteed with any other USB cable. Do not operate, turn off, or remove the camera battery or AC adaptor, or allow the computer to enter Sleep (Standby) mode until after the update is complete. This firmware update and any changes incurred by it are permanent. It is not possible to return to a previous firmware version after updating this firmware. By continuing this update process and downloading and updating this firmware, you acknowledge that you are aware and understand that this update cannot be reversed. Download the Update_FDRAX700V101.dmg file to a temporary or download directory (please note this directory for reference). Note: Do not connect the camera yet. Go to the directory where the file was downloaded and double-click the Update_FDRAX700V101.dmg file. On the desktop, double-click the UpdateSetting Tool icon. 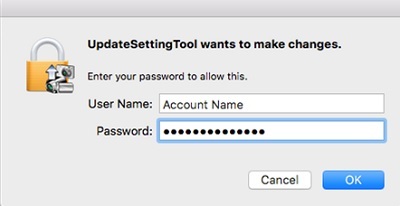 At the UpdateSettingTool prompt, enter the User Name and Password for the administrative account, and then click OK. If a System Extension Blocked message is displayed, click OK, and then at the Security & Privacy window, next to System software from developer "Sony Corporation" was blocked..., click Allow. If the Security & Privacy window remains even after you click Allow, click the X in the upper-right cormer to close the window. If you are asked to restart the computer after clicking Allow, restart the computer. Once the computer has restarted, on the desktop, double-click the UpdateSetting Tool icon. At the Check the Security & Privacy settings prompt, click OK. 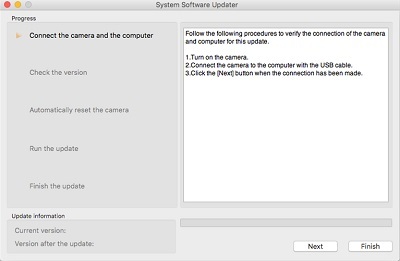 If you are using the Mac OS X 10.12 (or earlier) operating system, or if you have already authorized the Security & Privacy settings in the Mac OS X 10.13 operating system, at the Connect the device to the computer with the USB cable prompt, connect the camera to your computer using the supplied USB cable and then click OK. 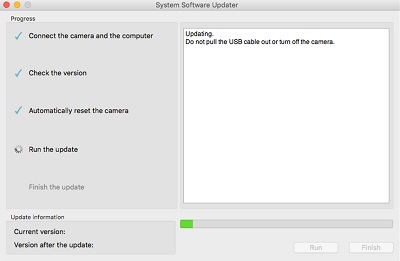 Note: If the message Could not find the camera for this update appears on the computer display, disconnect the USB cable and connect it again. Or, if the computer has multiple USB ports, try connecting to a different USB port. 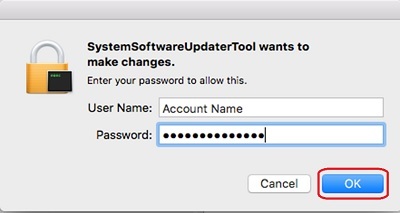 If a SystemSoftwareUpdaterTool prompt is displayed, enter the User Name and Password for the administrative account, and then click OK.
At the next System Software Updater screen, check the version number. Note: If the current version is 1.01 or higher, your camera does not need this update. 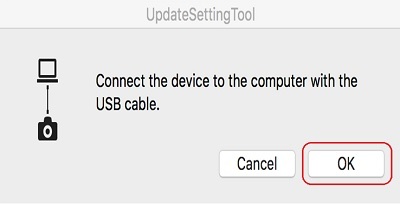 Stop the USB connection by clicking the Safely Remove Hardware icon in the task tray in the lower right corner of the computer screen, disconnect the USB cable, and click Finish. Then turn off the camera, briefly remove the battery pack or the AC adaptor, and then Turn on the camera again. If the current version is not 1.01, click Next to continue with the update. The camera will automatically reset and the following screen appears. A progress bar will be displayed while updating the system software (approximately 20 minutes). When the update is complete, the camera will automatically restart. Make sure the camera is turned on and when the LCD screen appears again, click Finish. The update has finished and you can disconnect the USB cable. If the version number is 1.01, the camera firmware was successfully updated. If the version number isn't 1.01, download and install the update again. Q: The update does not complete and the camera screen remains black for more than 15 minutes. Remove the battery and the AC adapter from the camera, leave them out for a few minutes, then reconnect. 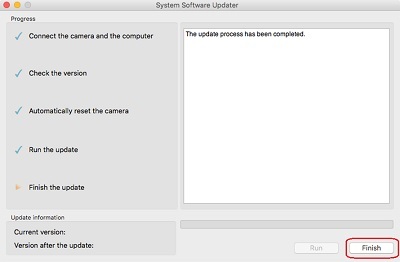 With the camera turned on, connect the camera and the computer using supplied USB cable, and perform the update process again. If the issue persists, delete the Update_FDRAX700V101.exe file from the computer, download the file again and repeat the update process.